The last day of summer. Looking back, it seems as if it all passed by so quickly. Warm days, green grass, flowers upon flowers, and the long daylight hours. The slow-pace of summer was a welcome friend and I sadly say goodbye to the beauty it brought into my daily life. I’ve never been one to deal well with change and as I look ahead, I see the rush and hustle of the holiday season fast approaching. The air is cooler and the summer fruits and produce are disappearing. It is hard to say goodbye, but even so, I do welcome fall with open arms. On this last day of summer though, I need a little comforting to prepare me for what lies ahead this season. Comfort for me means one thing: Chocolate. Chocolate is near and dear to my heart, as I am sure it is with yours. There is something intoxicating about the deep chocolate color, the smooth texture, and aromatic scent that soothes the soul. I spend a great deal of my time working with it and it amazes me how I never tire of it. The more time you spend around it, working with it, you discover that chocolate has a personality of its own. On any given day, it can be your best friend and cooperate beautifully and be a dream to work with. The next day, it is moody and rude and does not care that you are in a hurry. The world that is chocolate is vast and complex, but one can make it small and simple. When I first began writing in this space, I wondered how long it would take me to share something with chocolate here. It had to be right and it had to be great. Today, is that day. 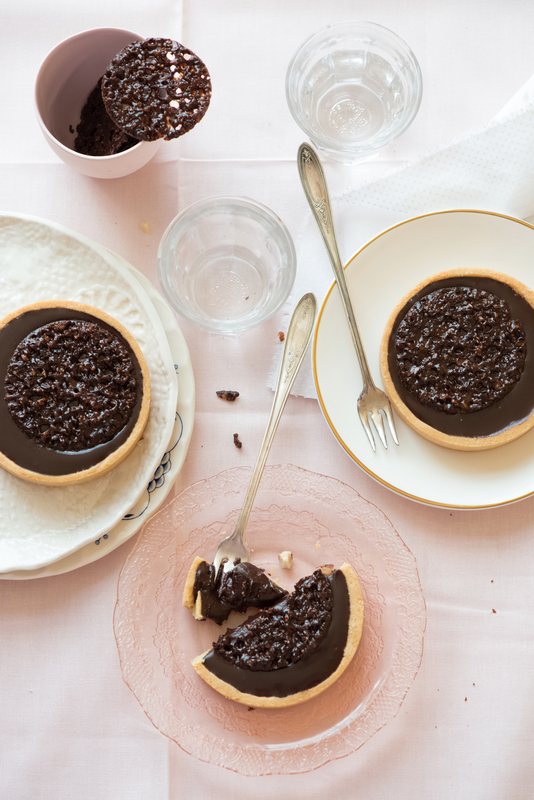 This chocolate hazelnut praline cocoa nib tart is small and simple, but it is a great place to start your journey with chocolate. The chocolate ganache is smooth and shiny, as it sit atop a layer of creamy hazelnut praline. The flaky tart dough is not too sweet, buttery, and crumbly. The cocoa nib dentelle adds a little glamour and crunch. Farewell summer. You’ve been good, but a new season begins. One with changing leaves, warm soups and stews, hot ciders, and above all else it is time for chocolate. Sift your first portion of powdered sugar and almond flour over your all purpose flour in a small bowl. Whisk them together to combine. Place butter in a stand mixer bowl, with paddle attachment, and cream on medium-low speed until smooth. Sift in your second portion of powdered sugar and mix, on medium-low speed, scraping down the sides and bottom of bowl to fully incorporate. Mix until mixture is fluffy, about one minute. Add vanilla bean seeds and mix on low to incorporate fully. Add dry ingredients in two additions, until just combined. Scrape the sides and bottom of bowl to incorporate. Your mixture will still be dry, with pea sized butter chunks. At this point, add egg and mix on low until just combined. Dough will be shaggy, not smooth. Transfer dough onto work surface and gently knead it together for a few seconds to bring it together. Lightly flatten into a round disk-shape and wrap in plastic wrap. Refrigerate until firm, about 2 hours, but preferably overnight. You may keep dough in the refrigerator for 2 days or 1 month, well wrapped, in the freezer. Preheat oven to 325F. Line a sheet pan with a Silpat or parchment paper. Remove chilled tart dough from refrigerator and roll out dough, on a lightly floured surface, approximately 1/8 inch thick. Line four, 3.5 inch, tart rings with dough. 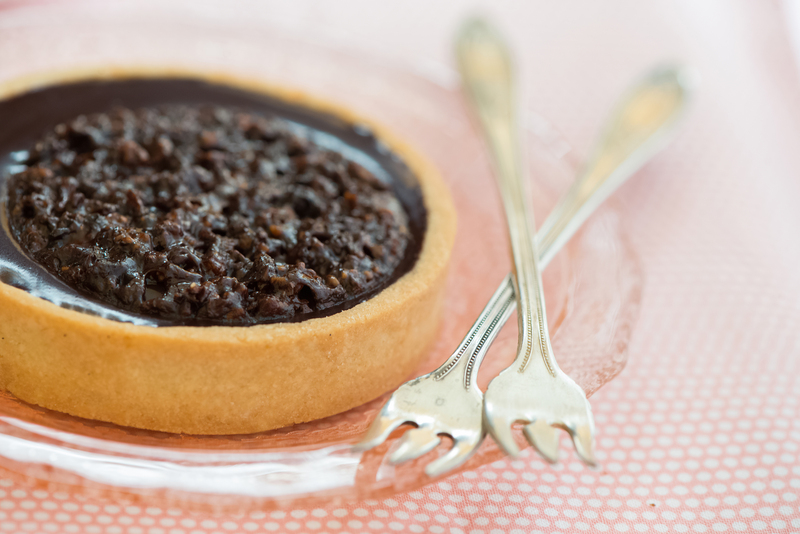 Prick the surface of the tarts with a fork, which will prevent air bubbles while baking. Place unbaked tarts, on a sheet pan, in the freezer for 20 minutes to chill. Remove from freezer, line each tart with a small piece of parchment paper and fill with raw rice or dry beans. Bake for 30 minutes, or until the dough is set and no longer sticks to the parchment. Remove parchment and dry filling, return pan to oven, and bake for 10 minutes more, until dough is golden brown. Remove from oven, carefully remove tart rings, and let cool. Melt your milk chocolate, in 15-30 second interval, in the microwave. Stir between intervals. Melt your cocoa butter in the same intervals, stirring in between. In a small bowl, combine your praline paste, milk chocolate, and cocoa butter. 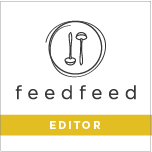 Add feuilletine and mix to combine. Spoon mixture onto the center of piece of parchment and top with a second piece of parchment. Roll out the praline to under 1/8 inch thick. Transfer onto a sheet pan and freeze until firm, at least 4 hours, but preferably overnight. Measure the bottom of your tart shell and choose a round cutter that fits best inside. 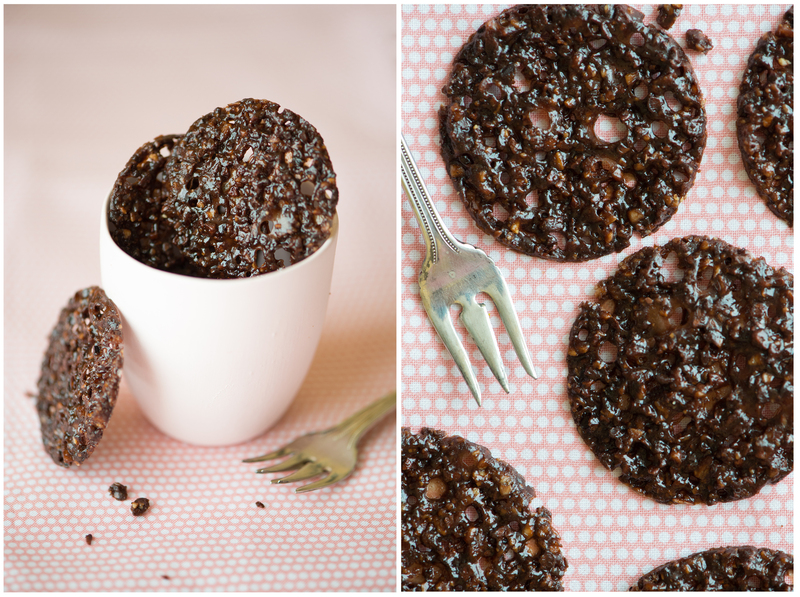 Remove praline from the freezer and cut out rounds. Return the praline rounds to the freezer to firm up. Once firm enough to handle, use a wide offset spatula to transfer each round to lay inside the tart shells. Set aside. Melt chocolate in a medium bowl. Set aside to cool slightly. In a saucepan, bring your cream and glucose to a simmer and pour over your chocolate. Stir, starting in the center and working your way outwards, together until smooth, shiny, and combined. Add your butter and stir to combine. 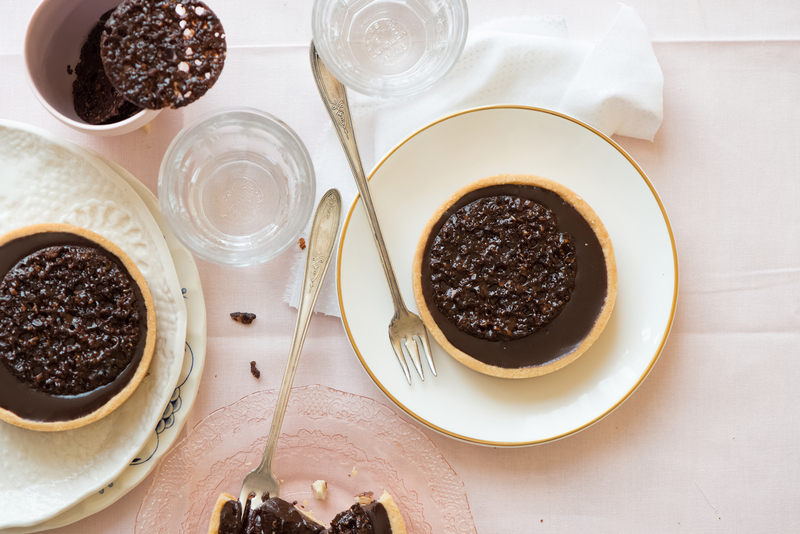 Pour ganache, on top of praline rounds, into the tart shells. Let set at room temerpature for at least 4 hours. Do not refrigerate tarts or the ganche will lose its shine and be too firm. Preheat oven to 350F. Combine sugar, butter, corn syrup, and milk in a small saucepan. Stir, over medium-high heat, until mixture reaches 230F/110C. Remove from heat and stir in hazelnuts, cocoa nibs, and cocoa powder. Pour out onto a piece of parchment, cover with a second piece of parchment, and roll out mixture as thin as possible. Transfer parchment to a sheet pan, remove the top piece of parchment, place in the oven for 12 minutes. After a few minutes it will begin to bubble and closer to 12, it will have smaller bubbles all over the surface. Remove from oven and set on cooling rack. Allow to cool 2 minutes, then cut out rounds (using a biscuit cutter size of your choice) while the dentelle is still pliable. Set your garnish rounds on top of each tart and serve. Recipe adapted from Thomas Keller’s Bouchon Bakery.